Most tolls on the Golden Gate Bridge will increase 25 cents on Friday. 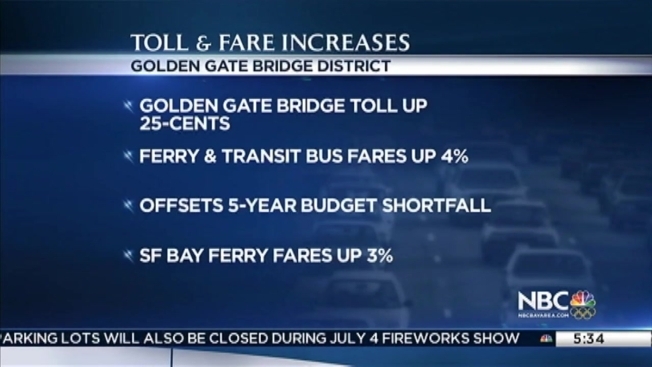 Fares on Golden Gate Transit buses and Golden Gate Ferry service also will increase 4 percent Friday, Golden Gate Bridge, Highway and Transportation District spokeswoman Priya Clemens said. The FasTrak toll on the bridge will increase to $6.50 for two-axle vehicles, $7.50 for Pay-by-Plate and to $4.50 for carpool vehicles. The one-way adult fare for the Larkspur Ferry will increase 50 cents to $11 and to $11.75 one-way on the Sausalito Ferry. One-way Clipper fares on the ferries will increase 25 cents to $7.25 on the Larkspur and $6.25 on the Sausalito ferries. The one-way fare for youth 5-18, seniors 65 and up and for disabled riders will increase 25 cents to $5.50 on the Larkspur Ferry and to $5.75 on the Sausalito Ferry. Children ages 4 and under ride free, but there is a two-child limit per fare-paying adult. The toll increase will help balance a projected five-year deficit of $33 million, Clemens said.